In 2008 I visited the Affordable Art Fair in Battersea and saw a glass picture that I absolutely adored. Sadly it wasn’t affordable to me at the time and despite wandering past it many many times on the day and trying to justify how I could possibly buy it, I left without it. To describe the picture will not do it justice but I’ll try. Essentially the back piece of glass was the size the picture but fused to that glass was other smaller pieces of dichroic glass which were arranged in such a way that to look at the picture straight ahead you saw a circle of gently coloured glass protruding. However the real beauty to me was that the dichroic elements of the glass played with the light so that it danced around the room. As the day/evening light changes or perhaps the flickering of a fire or candle, the light would scatter and move. For me, this piece of art would engage me in staring and losing myself in the movement of the light. I have so regretted not putting the price of this piece of art on a credit card! Every year I have returned to the Affordable Art Fair and for several years after this visit, David Mitchell’s artwork had increased incrementally with that money that I’d saved! I don’t feel that I’ll ever own a piece of his artwork. The last time I saw David’s work at AAF however I got a little cross. The price, once more, was out of my reach (good for David!) and whilst stomping off disappointedly, I said under my breath I guess the only way is for him to teach me how to make it myself. Hehe he heard my muttering and said ‘OK then’! Nearly two years later, I sent him an email to ask if he’d been serious and if so, how much. So, this past few days have been fan-blinking-tastic. Holed up in David’s studio having one to one tuition about the many different methods of glass fusion. 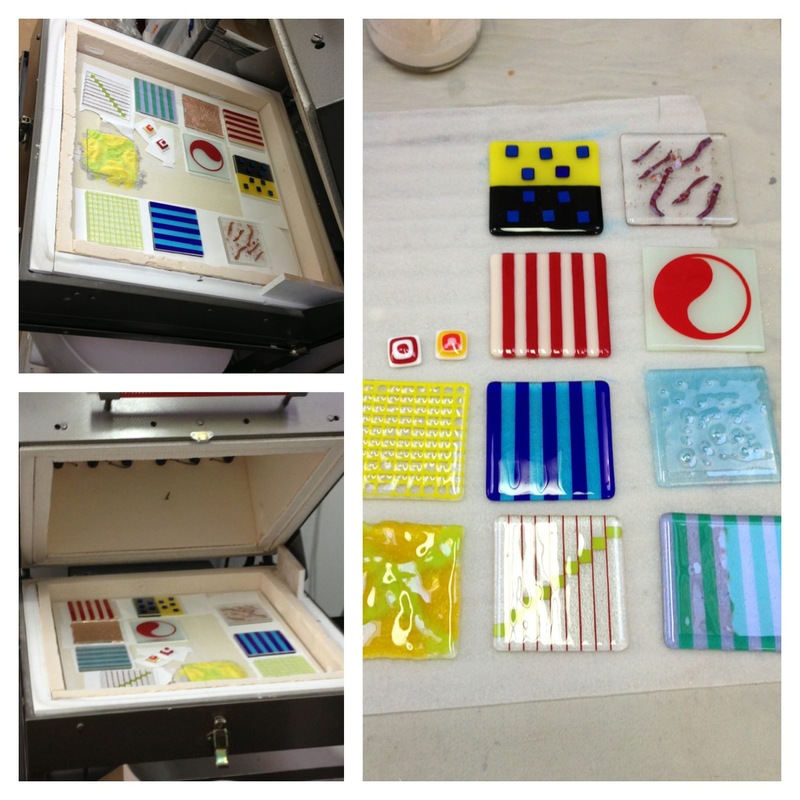 Wow there’s a lot to learn but most important is the ability to accurately cut glass… I have much more practice to do! 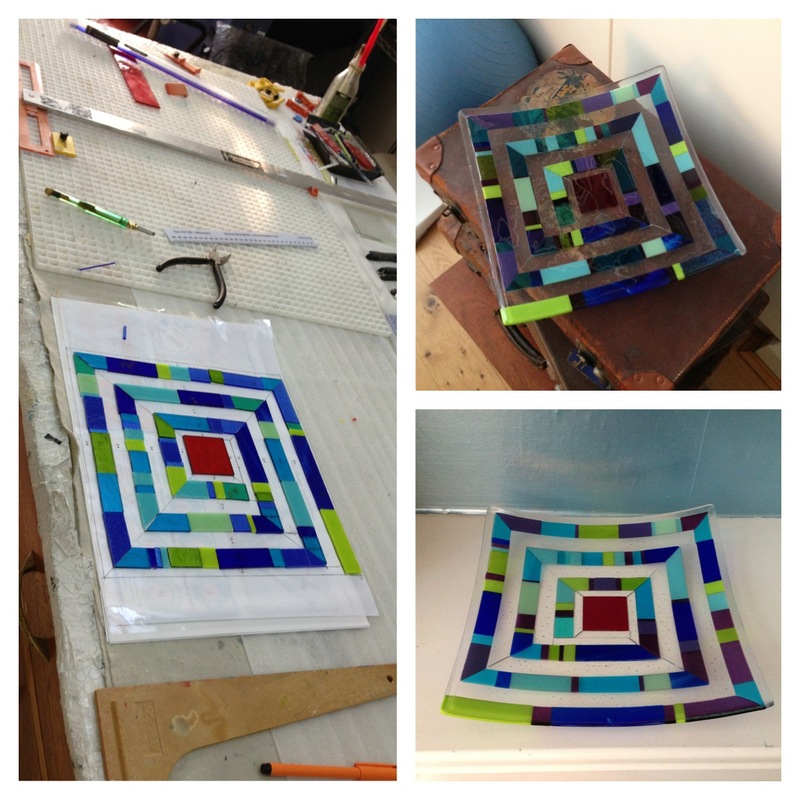 On the second day, David set me the challenge of designing, drawing and creating a square bowl. Several hours were spent simply drawing the design as it had to be absolutely accurate in order that the eventual glass piece would similarly be accurate. (I learnt the hard way that perhaps my design should have been slightly simpler for a first piece!). As you can see from the picture below there were many pieces of glass and many ‘millimetres’ that required perfection. Not to mention the 45* corners that also needed cutting perfectly. Despite a few imperfections that I can see (and now that I’ve pointed them out, you may see also), I’m really chuffed with my bowl, coasters and buttons that I made on the course. My task now is to practice cutting glass so that there are more ‘perfect’ cuts than ‘imperfect’ ones. Then… I’m hoping… David will take me back for another course whereupon I can learn to fuse dichroic glass pieces and make my own picture. This entry was posted in Living and tagged Colour by AnnaGoAnna. Bookmark the permalink.